what Venezuelan child has not seen violence in the streets and in daily life, particularly in Caracas? Actually MO, and Guillermo A., the foto was taken December 26th, 2009. The photographer already proved the picture was taken on december 9th. 2009. The only way we can fight lies is with the truth.Lies are expressed in omission just as much as in commission. The only way we can stand up to hypocrisy is to stand up. Every time we worry about being politically correct, or appropriate for all sensitive ears we are worried that the truth is somehow to be apologized for. What a waste of resources! 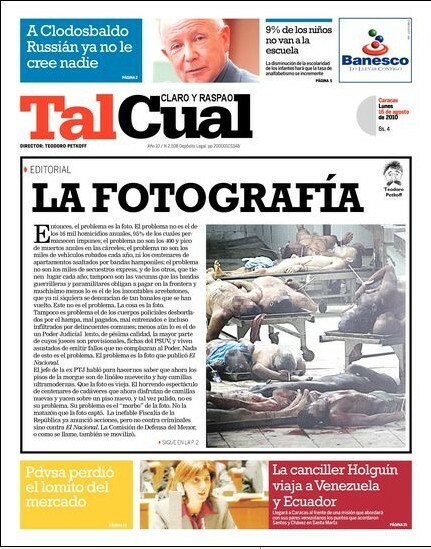 Now they say the photo was taken many years ago so… it’s just a scam pulled by el Nacional. Now, they say it’s a problem for the children, the good venezuelan children whose development is being put in jeopardy because that picture. Come on. What a hypocritical argument!